For two weeks now, gold/silver equity shares have been whacked by our banker friends even though silver and gold metal have been on a tear for the past 8 weeks. To me, it seems that the equity shares are being hit trying to convince holders of real metal to sell their physical. I strongly believe that the comex has very little real gold/silver to serve gold/silver longs. In January reported that the total amount gold inventory at the FRBNY was 7,841 million dollars worth of gold valued at 42.21 dollars per oz. In silver, the total open interest FELL by 9,731 contracts DOWN to 199,568 with respect to YESTERDAY’S TRADING. In ounces, the OI is still represented by just less THAN 1 BILLION oz i.e. 0.997 BILLION TO BE EXACT or 142% of annual global silver production (ex Russia & ex China). In gold, the total comex gold FELL BY ONLY 2 contracts WITH THE FALL IN THE PRICE GOLD ($0.20 with YESTERDAY’S trading ).The total gold OI stands at 452,363 contracts. China wishes to tighten a little as they are limiting their money supply growth to 12% from 13%. Remember that their debt is totally unsustainable. ii)Europeans are piling into their VIX as they have hit the panic button with respect to upcoming elections, thew BREXIT and potential Italian-EXIT and others. Interestingly enough the European VIX is 80% higher than the USA. I wonder why? ii)Bullion star posts 9 charts which suggest that gold demand (physical) is very strong. iii)Two good commentaries today from James Turk and Egon Von Greyerz. First Turk comments on the huge silver short position and how these shorts are digging in as they will not let silver advance. Von Greyerz comments on the huge target 2 imbalances and he correctly states that Germany and Luxembourg are in much greater danger than southern banks as these imbalances can never be paid. The total gold comex open interest FELL BY ONLY 2 CONTRACTS UP to an OI level of 452,363 DESPITE THE FALL IN THE PRICE OF GOLD ( $0.20 with YESTERDAY’S trading). We are now in the contract month of MARCH and it is one of the poorer delivery months of the year. In this MARCH delivery month we had a LOSS of 186 contracts DOWN to 639. The next active contract month is April and here we saw it’s OI FALL by 682 contracts DOWN TO 291,639. The next big active month is June and here the OI ROSE by 810 contracts up to 83,490. The next big active delivery month is March and here the OI decrease by 10,061 contracts down to 7299 contracts or by definition a whopping 36,495,000 oz will stand. For historical reference: on the first day notice for the March/2016 silver contract: 19,020,000 oz. However the final amount standing at the end of March 2016: 6,755,000 oz as the banker boys were busy convincing holders of many silver contracts to cash settle. We had 349 notice(s) filed for 1,745,0000 oz for the MARCH 2017 contract. Today the estimated volume was 214,675 contracts which is good. Today, 0 notice(s) were issued from JPMorgan dealer account and 0 notices were issued from their client or customer account. The total of all issuance by all participants equates to 1 contract(s) of which 0 notices were stopped (received) by jPMorgan dealer and 0 notice(s) was (were) stopped/ Received) by jPMorgan customer account. To calculate the initial total number of gold ounces standing for the MARCH. contract month, we take the total number of notices filed so far for the month (1) x 100 oz or 100 oz, to which we add the difference between the open interest for the front month of MARCH (639 contracts) minus the number of notices served upon today (1) x 100 oz per contract equals 63,900 oz, the number of ounces standing in this active month of MARCH. average 16.447 tonnes per month vs last yr 61.82 tonnes total for 15 months or 4.12 tonnes average per month (last yr). ***deposits into JPMorgan have now resumed again. Thus the initial standings for silver for the March contract month: 349(notices served so far)x 5000 oz + OI for front month of FEB.( 7299 ) -number of notices served upon today (349)x 5000 oz equals 36,495,000 oz of silver standing for the Mar contract month. This is huge for AN active delivery month in silver. Today the estimated volume was 63,516 which is excellent!!! FRIDAY’S confirmed volume was 100,678 contracts which is gigantic. *LAST 46 TRADING DAYS: A NET 16.57 TONNES HAVE NOW BEEN ADDED INTO GLD INVENTORY. 1. Central Fund of Canada: traded at Negative 8.6 percent to NAV usa funds and Negative 8.4% to NAV for Cdn funds!!!! Note: Sprott silver trust back into NEGATIVE territory at -0.18% /Sprott physical gold trust is back into POSITIVE territory at +0.06%/Central fund of Canada’s is still in jail. How much an Oscar is actually worth? It’s the day after the Oscars and we’ve got gold on our minds! 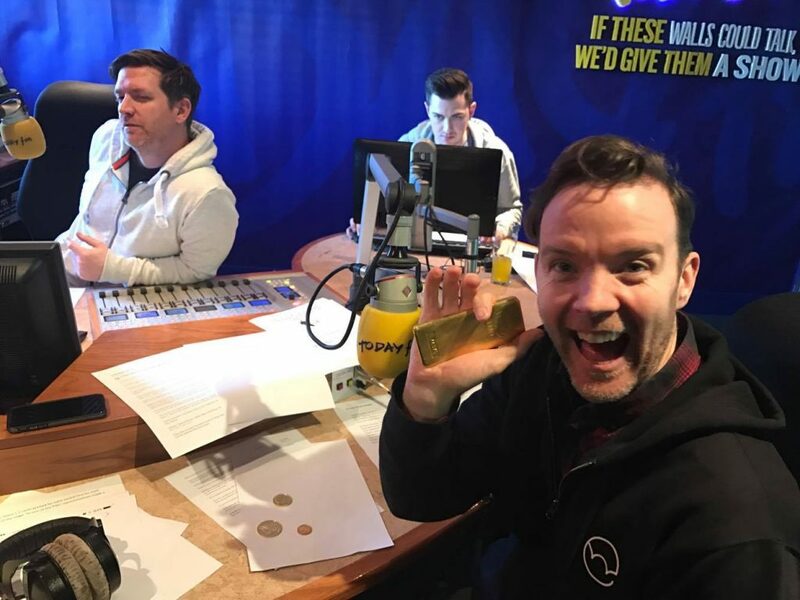 Mark O’Byrne from Goldcore Ireland popped in to chat to Dermot & Dave this morning. The entire statue is actually only sprayed with gold and is therefore worth a measly €600. While gold prices in dollars has been on a tear – almost erasing its post-Trump losses – the price of the precious metal in euros has soared as European elections loom. As Bloomberg notes, in the Netherlands, Geert Wilders’ anti-Islam Freedom Party is holding a slim lead in polls before elections next month, and French presidential candidate Marine Le Pen has campaigned on overturning France’s ruling elites. February is set for the biggest gains (almost 6%) since June 2016 (pre-Brexit) nearing the Maginot Line of EUR1200 once again. Bullion star posts 9 charts which suggest that gold demand (physical) is very strong. Two good commentaries today from James Turk and Egon Von Greyerz. First Turk comments on the huge silver short position and how these shorts are digging in as they will not let silver advance. 3b Japan 10 year bond yield: RISES TO +.056%/ !!!! (Japan buying 100% of bond issuance)/Japanese yen vs usa cross now at 112.27/ THIS IS TROUBLESOME AS BANK OF JAPAN IS RUNNING OUT OF BONDS TO BUY./JAPAN 10 YR YIELD FINALLY IN THE POSITIVE/BANK OF JAPAN LOSING CONTROL OF THEIR YIELD CURVE AS THEY PURCHASE ALL BONDS TO GET TO ZERO RATE!! 30 SNB (Swiss National Bank) still intervening again in the markets driving down the SF. It is not working: USA/SF this morning 1.0046 as the Swiss Franc is still rising against most currencies. Euro vs SF is 1.0651 well above the floor set by the Swiss Finance Minister. Thomas Jordan, chief of the Swiss National Bank continues to purchase euros trying to lower value of the Swiss Franc. With traders focused on President Trump’s address to Congress tonight where he is expected to outline his economic priorities and provide plan details, European stocks are little changed for a second day and Asian stocks decline modestly as U.S. futures trade around the flatline. Oil declines, trading just under $54, while the dollar is little changed. Before the open, the US reports the second reading of 4Q GDP, with attention also on the Chicago PMI print as well as the Conference Board consumer confidence index. Salesforce and Ross Stores are among companies reporting. World stocks hover just shy of all-time highs and are on course for a fourth straight month of gains on Tuesday, as investors awaited a speech by U.S. President Donald Trump for signals on infrastructure spending and tax cuts. Global share markets have risen more than 10 percent since Trump won power in November and investors are hoping a speech to U.S. Congress later will detail his “big” spending promises. Traders are in a holding pattern ahead of Trump’s State of the Union address before a joint session of Congress. It actually is technically called the State of the Union as it’s his first address but it’s the annual event that will become it. Yesterday’s headlines were largely dominated by reports of Trump proposing to boost military spending by $54bn, offset by cuts in nonmilitary budgets. The President was also reported as telling governors yesterday that “we’re going to start spending on infrastructure, big” but in reality markets were largely unmoved by the headlines and clearly just waiting for the main event. As DB’s Jim reid writes, perhaps the biggest focus for the market in the address are clues as to whether the President supports the much talked about border adjustment tax – a key feature of House Speaker Ryan’s tax reform plan. Economists believe that the President will not directly mention the BAT but will highlight the necessity of increasing economic growth and work wages. Other topics which could be addressed include repealing of the Affordable Care Act, pulling out of trade agreements, immigration, de-regulation and of course other tax cuts. In terms of timing the address is scheduled for 9pm EST in the US tonight. Ahead of Trump, asian markets were subdued overnight but some upbeat company earnings helped European stocks add 0.1 percent as the region looked to pull out of a three-day lull and extend a 2.5-percent gain this month. The Stoxx Europe 600 Index was little changed by 10:08 a.m. in London, after four straight days of losses. The index is still up 2.6 percent for February. Asia stocks erased gains after Japan’s Topix gave up almost all of a 1 percent rise, with the steepest paring coming in the final half hour of trading. The MSCI Asia Pacific Index trimmed its monthly gain to 2.2 percent. In the currency markets, the dollar which has not taken to the Trump trade quite so enthusiastically, was treading water against most of its major peers, with the only notable move a dip against the yen to 112.25. As Bloomberg cautions, even as global equities climbed to record levels, investors have remained wary as they await details of Trump’s economic policies and watch for signals on the timing for higher rates. The White House began sketching out plans Monday, as Trump followed promises of infrastructure spending with a caution that tax details won’t become clear until after the costs of repealing the Affordable Care Act are known. “Tonight is going to be about laying out the agenda,” Paul Kavanagh, chief executive officer of Patronus Partners Ltd. in London, said in an interview on Bloomberg radio. “The bond markets and the stock markets are going to be listening. To push through on many of the initiatives that he’s looking for over the next few months, he’s got to be relatively downbeat about the things that he will want to change.” Fed Bank of Dallas President Robert Kaplan said policy makers should raise interest rates “sooner rather than later” and not pay excessive attention to market expectations. The chance of a rate hike at the central bank’s March 14-15 meeting jumped to 50 percent, federal funds futures showed, from 34 percent just five days ago. Gold was also steady, having hit a 3-1/2 month high on Monday and 10-year U.S. Treasury yields hovered at about 2.36 pct, some 10 basis points down on where they started the year. That suggests that bond investors at least are fully convinced about a substantial pick-up in U.S. growth and higher interest rates. “While markets no doubt appear to like what they are hearing, the president now needs to deliver, he’s talked the talk and he now needs to walk the walk,” CMC markets chief strategist Michael Hewson said. Trump met U.S. state governors at the White House on Monday and said he sees “big” infrastructure spending and that he is seeking a “historic” increase in military spending of more than 9 percent. That means some $54 billion of military spending is now on the table, though that appears to be funded by cuts elsewhere in government. Led by engineering, construction and defense firms, Wall St stocks eked out another all-time high, with the Dow Jones recording its 12th straight record, a winning streak not seen since 1987. Futures pointed to it struggling to keep the run going later. Yields on 10-year Treasuries were little changed after climbing five basis points on Monday. European government bonds traded in a tight range. The German 10-year yield rose two basis points to 0.22 percent. Peripheral bonds extended Monday’s gains as 10-year Italian yields fell three basis points to 2.1 percent. Asia equity markets were modestly lower, continuing the lacklustre lead from Wall Street where all 3 major US indices closed in the green and the DJIA notched a 12th consecutive daily gain amid outperformance in the energy sector, although upside was minimal as participants looked ahead to Trump’s appearance at Congress. ASX 200 (-0.2%) saw similar outperformance in energy names as WorleyParsons shares surged 30% although the index then turned negative at the settlement. Nikkei 225 (+0.3%) was underpinned by JPY weakness seen in the prior session, while Shanghai Comp. (+0.4%) and Hang Seng (-0.7%) were somewhat indecisive after another uninspiring liquidity injection by the PBoC, with participants in Hong Kong also awaiting earnings from the major casino operators. 10yr JGBs were lower amid an increased risk appetite in Japan, with mild pressure also seen following a 2yr auction in which the b/c fell and tail-in price widened from prior. European bourses are trading relatively flat, albeit on the softer side with slight underperformance in materials, with the likes of Randgold Resources and Fresnillo lagging in the FTSE 100. Although the slightly negative tone is largely owing to the cautiousness among investors ahead of Donald Trump’s speech to a joint sitting of the US Congress at 2100ET. Across fixed income markets, the GE-FR spread has seen another bout of narrowing with the spread tighter by around 2.5bps, while peripheral yields has been tightened against the German benchmark. However, gilts have underperformed after the latest Lloyds Business Barometer rose to its highest level since Mar’16 suggesting a potential rise in the upcoming PM! survey’s next month. Salzgitter Slumps; Warburg, Lampe Say Pretax Outlook Below Ests. In currencies, the Bloomberg Dollar Spot Index fell less than 0.1%. The yen added 0.3 percent to 112.35 per dollar, after sliding 0.5 percent Monday to snap a three-day winning streak. Tt has been a very quiet morning in FX so far, with the markets looking to get the Trump address to Congress out of the way before initiating some fresh direction on the USD. Month end flow can produce some erratic price action, and this will further hamper liquidity as traders are content to stay on the sidelines for now. Both the EUR and JPY hold their ground vs the greenback despite a modest rise on UST yields; EUR is keeping in touch with 1.0600 but perhaps of greater focus is USD/JPY still hovering ominously above the 112.00 mark. US data today — GDP Q4 second reading, trade and wholesale inventories may (of may not) back some of the increasing odds of a March move, with some seeing the probability moving up to a little over 50%. Concerns that the Fed is falling behind the curve due to the inflationary impact on real yields the key driver. The British pound slipped 0.1 percent to $1.2425. The currency is down 1.2 percent for the month. In commodities, gold has pulled back as the USD index recovers in line with yields, and is now trading closer to $1250.00 after briefly piercing the $1260.00 level. Little else behind this, with Silver following lower in tandem, but the relatively tight ranges are reflective of the uncertainty over president Trump’s speech to the joint session of Congress later today. Oil prices have moved off better levels again as OPEC reiterates the disparity in compliance on production cuts between members and non members. WTI has slipped back under USD54.00 again. Base metals continue to tread water across the board, with Zinc outperforming to a modest degree again. Looking at the day ahead, the main highlight on the data front will be the second reading on Q4 GDP. The market expects the reading to be revised up to 2.1% qoq annualized (from 1.9%). Also due out is the January advance international goods trade deficit reading, wholesale inventories for January, the S&P/Case-Shiller house price index reading for December, Chicago PMI for February, consumer confidence reading for February and Richmond Fed manufacturing index for February. Away from that there’s no shortage of Fedspeak with Harker (3pm ET), Williams (3.30pm ET) and Bullard (6.40pm ET) all on the slate. That all comes before what is likely to be the main event though when President Trump delivers his aforementioned quasi State of Union address overnight. So strap in. A decade ago this morning I set the alarm for 4.30am, jumped out of bed and immediately started work on the first Early Morning Reid after some preparation the night before. Approximately 2500 editions later and the pattern hasn’t changed much. Thanks to all the main contributors to this piece over the last decade. This piece wouldn’t have gone out without them. In today’s edition we’ve republished the first copy from February 28th 2007 where we discussed how we were moving underweight credit as the silent destruction of the US sub-prime market had started with BBB ABX tranches moving from par to the mid-80s that month. As such we’ve always felt that the financial crisis started in February 2007. To the present now where the last 24 hours and likely the next 19 hours or so has pretty much been about prepping the stage for President Trump’s State of the Union address before a joint session of Congress. It actually is technically called the State of the Union as it’s his first address but it’s the annual event that will become it. Yesterday’s headlines were largely dominated by reports of Trump proposing to boost military spending by $54bn, offset by cuts in nonmilitary budgets. The President was also reported as telling governors yesterday that “we’re going to start spending on infrastructure, big” but in reality markets were largely unmoved by the headlines and clearly just waiting for the main event. Perhaps the biggest focus for the market in the address are clues as to whether the President supports the much talked about border adjustment tax – a key feature of House Speaker Ryan’s tax reform plan. Our US economists highlighted in their daily yesterday that their best guess is that the President will not directly mention the BAT but will highlight the necessity of increasing economic growth and work wages. Other topics which could be addressed include repealing of the Affordable Care Act, pulling out of trade agreements, immigration, de-regulation and of course other tax cuts. In terms of timing the address is scheduled for 9pm EST in the US tonight. For those in Europe you’ll want to set your alarms for 2am GMT tomorrow morning. In terms of markets yesterday, after European stocks turned in a fairly cautious session (Stoxx 600 -0.13%, DAX +0.16%), bourses in the US chopped and changed for much of the afternoon before closing with another round of very modest gains. Still the Dow (+0.08%) notched up its 12th consecutive record close which is the longest such streak since January 1987 while the S&P 500 edged up +0.10%. Gains for the energy sector appeared to help after WTI Oil rose a little over 1% at one stage, only to then retrace into the close. Of some excitement we did see the VIX rise over 5% and in doing so closed above 12 (at 12.09 to be precise) for the first time since January 19th. The direction was a bit more obvious in bond markets yesterday. Both Treasuries (+5.3bps to 2.366%) and Bunds (+1.3bps to 0.197%) undid a portion of Friday’s rally however it was more of the same for OATs (-4.4bps to 0.872%) and the periphery (-5bps to -6bps lower) seemingly after the weekend passed without any negative market developments in the French election campaigns. Over in the Asia this morning it’s actually been an overall fairly decent session. Bourses in Japan in particular are performing well (Nikkei +0.78%, Topix +0.93%) despite an overall mixed bunch of data releases. Industrial production in Japan in January was unexpectedly soft (-0.8% mom vs. +0.4% expected) however that was offset by a better than expected retail sales print (+0.5% mom vs. +0.3% expected). Elsewhere in markets the Shanghai Comp (+0.28%), Kospi (+0.34%) and ASX (+0.29%) have also edged higher while the Hang Seng is little changed. Moving on. Yesterday we published a new Credit Bites – “Credit Foundations Creaking?” – looking at 5 year swap spreads and its relationship with credit. Over the last few weeks 5 year Euro swap spreads have widened to the highest level outside of the 08/09 GFC and the 11/12 Euro sovereign crisis. So far credit spreads to governments haven’t matched the move and as such ASWs are looking tight given the external developments. If bunds are rallying because of a possibility of being redenominated back into DEM at some point, credit should not be following the yield move lower and should be widening given the turmoil that such a scenario would bring. Clearly if Le Pen fails to become President (as the vast majority believe) then bunds will eventually sell-off, swaps spreads will tighten and the pressure will be taken off credit spreads but for now European fixed income is sending conflicting messages of the potential risks. See the report from yesterday morning for more. Email Sukanto.Chanda@db.com if you haven’t got a copy. With regards to yesterday’s dataflow, in the US headline durable goods orders came in a better than expected +1.8% mom in January (vs. +1.6% expected) driven by a sharp rebound in aircraft orders. Disappointing however were the core capex orders where orders fell -0.4% mom (vs. +0.5% expected). Shipments (-0.6% mom vs. +0.2% expected) also fell unexpectedly. There was better news in the Dallas Fed manufacturing survey however where the reading rose 2.4pts in February to 24.5 and so reaching the highest level since April 2006. Finally pending home sales in January were revealed as declining -2.8% mom. Closer to home, the European Commission’s economic sentiment index reading was reported as rising a very modest 0.1pts to 108.0 this month and so touching a six year high. Our economists also noted that the ECB’s January M3 and credit data showed stable money supply growth but improving credit flows. Since a soft Q3 2016, euro area bank credit has accelerated, with January the strongest month for net private sector bank lending (EUR +31bn) since 2008. Loans flows over the past four months are equivalent to annual credit growth of close to 3%. The only other data to note is that of the ECB’s CSPP buying. Total holdings last week was reported at €66.6bn which works out to net purchases settled last week of €1.7bn or an average daily run rate of €335m. That’s a shade below the €366m average since the program started. Looking at the day ahead, this morning in Europe we’ll be kicking off in France where the preliminary CPI figures for January will be released, alongside Q4 GDP data and January consumer spending data. Over in the US this afternoon the main highlight on the data front will be the second reading on Q4 GDP. Both the market and our US economists expect the reading to be revised up to 2.1% qoq annualized (from 1.9%). Also due out is the January advance international goods trade deficit reading, wholesale inventories for January, the S&P/Case-Shiller house price index reading for December, Chicago PMI for February, consumer confidence reading for February and Richmond Fed manufacturing index for February. Away from that there’s no shortage of Fedspeak with Harker (8pm GMT), Williams (8.30pm GMT) and Bullard (11.40pm GMT) all on the slate. That all comes before what is likely to be the main event though when President Trump delivers his aforementioned quasi State of Union address overnight. So strap in. For a majority of China watchers, while Beijing’s goalseeked GDP reports are largely dismissed as politburo propaganda, most of the attention falls on the PBOC and banking sector’s credit creation, and particularly, how this translates into broad money supply, or M2, growth: after all, in a nation which has roughly $35 trillion in bank assets, the biggest variable is how much cash is being injected into the system, and what happens with said cash. Which is why a Reuters report overnight that China plans to target broad money supply growth of around 12 percent in 2017, down from 13 percent in 2016, has been promptly noted as the latest signal to contain debt risks while keeping growth on track. The M2 growth target was endorsed by leaders at the closed-door Central Economic Work Conference in December, according to sources with knowledge of the meeting outcome. As a reminder, yesterday even the NY Fed released a note in which central bank researchers warned about the unsustainability of Chinese debt. Under the PBOC’s new “prudent and neutral” policy, the central bank has adopted a modest tightening bias in a bid to cool torrid credit expansion, though it is treading cautiously to avoid hurting the economy. In 2016 China’s money supply target was 13%, roughly double the country’s GDP , though it ultimately grew just 11.3% due to the effects of the central bank’s intervention to support the yuan currency, which effectively drained yuan liquidity from the economy. Last year’s M2 target reflected Beijing’s focus on meeting its economic growth targets, but top leaders have pledged this year to shift the emphasis to addressing financial risks and asset bubbles. However, as we have shown in the past, M2 is just one aspect of liquidity injections: the PBOC injected more cash through its open market operations, medium-term lending facility (MLF) and standing lending facility (SLF), underpinning record lending of 12.65 trillion yuan ($1.84 trillion) in 2016. Reuters has also reported that for 2017, China will lower its economic growth target to around 6.5% from last year’s 6.5-7 percent. The economy expanded 6.7 percent in 2016. Last week, state media cited a party statement issued after a meeting of the Politburo that China must maintain stable economic development and social harmony ahead of the 19th Communist Party Congress in the autumn. Key economic targets will be announced at the opening of the annual parliament meeting on March 5. Whether China adopts the target or not, it is merely the latest indicator of tighter monetary policy this year. As we discussed at the start of the month, the central bank raised interest rates on its reverse repurchase agreements (repos) and the SLF on Feb. 3, following a rise in rates on the MLF in late January. “The central bank could raise such policy rates further. But we cannot see any possibility of raising benchmark interest rates in the near term,” said one of the sources. Meanwhile, reversing the tightening trend, new yuan loans hit 2.03 trillion yuan in January, the second highest on record, due to a rush among lenders to maintain market share, while M2 rose an annual 11.3 percent in January. The central bank said in a working paper published on Feb. 15 that the debt deleveraging process should be managed prudently to help avoid a liquidity crisis and asset bubbles. China’s debt-to-GDP ratio rose to 277 percent at the end of 2016 from 254 percent the previous year, with an increasing share of new credit being used to pay debt servicing costs, UBS analysts said in a recent note. Meanwhile, total bank assets to GDP is now well over 300%. The biggest problem facing the massively indebted economy, however, remains one of a declining marginal impact of every incremental yuan of new debt. “A decline in driving force from capital investment on economic growth is behind the rapid rise in leverage,” Ruan Jianhong, head of the Survey and Statistics Department at the central bank, said in remarks published on Friday. In 2011, capital investment of 1 yuan could yield an increase of 0.32 yuan in GDP, but that has fallen to 0.16 yuan in 2015, Ruan told the official Financial News in an interview. “We need to maintain appropriate economic growth. If growth slows sharply, various risks may be exposed,” said one of the sources. Of which the biggest being that China has now reached the Ponzi financing stage, and any incremental slowdown in debt creation will usher in the next and final step: the Minsky moment. It didn’t take much for the Greek bank run jog to return: with Greece once again stuck between an IMF rock and a Schauble hard case, and whispers that another bailout may be on the horizon, the local population took advantage of whatever capital controls loopholes they could find, and withdrew money from the local banking sector, which to this day remains on ECB life support, almost two years after the 3rd Greek bailout in the summer of 2015. According to Greece central bank data, Greek private sector bank deposits declined in January for the second month in a row, driven by renewed concerns over the country’s neverending bailout. Business and household deposits fell by €1.63 billion, or 1.34% month-on-month to €119.75 billion ($126.8 billion), the lowest level since November 2001. The January outflow follows a “jog” of €3.4 billion in December, making the two-month drop the worst since the latest Greek bailout panic in July of 2015. And as concerns about the Greek fate only grew in February, it is likely that the next month’s data will show another acceleration in outflows, especially since Greek non-performing loans remain at a staggering 70% of total bank assets and continue to grow. As Reuters further notes, starting in December, the Bank of Greece stopped counting deposits of 4.2 billion euros held in the Loans & Consignment Fund and another 2.1 billion euros in the Deposit Guarantee Fund (TEKE) as private sector deposits. The move followed a reclassification by the country’s statistics service ELSTAT, which groups the two institutions under the general government sector. The latest two months of outflows put an end to a period of relative stability during which Greek banks had seen small deposit inflows in more than a year after the country clinched a third bailout to stay in the euro zone. Local banks, for the most part insolvent, remain dependent on central bank borrowing to plug their funding gaps. The gap between outstanding loans and deposits has forced banks to rely on borrowing from the European Central Bank and the Bank of Greece to plug their funding holes. Greece’s banking sector saw a 42 billion euro deposit outflow from December 2015 to July last year. Capital controls imposed on June 2015 helped contain the flight but sharply increased banks’ dependence on emergency liquidity assistance (ELA) from the Bank of Greece. bailout-mandated reforms and improved confidence in the banking system. Following the latest deposit outflow data, that may soon change. As part of the relaxation of controls, “mattress” cash that are returned to banks are not subject to the restrictions, meaning amounts deposited can be fully withdrawn. That is, of course, assuming the upcoming showdown between the members of the Troika ends amicably. Should the outflows persist as this rate, Greece will be back on the front pages, and demanding a 4th bailout by mid-Spring, and certainly ahead of the looming July 2017 debt maturities. Europeans are piling into their VIX as they have hit the panic button with respect to upcoming elections, thew BREXIT and potential Italian-EXIT and others. Interestingly enough the European VIX is 80% higher than the USA. I wonder why? While US equity markets drift endlessly higher on sea of Trumptopian euphoria (and retail ETF ramps), European equity investors have hit the panic button this week. In the last week, investors have been piling into European VIX futures – hedging for a potential catastrophic end to the market calm ahead of French and Dutch elections. Historically, European ‘VIX’ has traded around 20% higher than US ‘VIX’ over the last 8 years. The current spike to an 80% premium is unprecedented. The extreme differences between Europe’s ‘fear’ and America’s ‘greed’ is nowhere more evident than in this chart and suggests – for the contrarian who sees record short US VIX positioning – a Long US VIX, Short EU VIX position may be the play through the turmoil of the next month or two. Nearly 20 states have raised gas taxes or recalculated gas-tax formulas in recent years to generate additional revenues. Which, of course, is an extremely politically expedient way to raise taxes on the unsuspecting masses since when gas prices soar later those price increases can simply be blamed on those evil oil corporations. As the Wall Street Journal points out, the ease with which higher gas taxes have been passed through state governments over the past two years have emboldened at least a dozen more states, all of which are now actively considering additional gas taxes. In yet another map that looks eerily similar to the 2016 electoral college map, here is where states currently stand on gas taxes. Of course, the irony here is that the ultra-liberal states of the Northeast and West coast have the highest gas taxes…and while that might play well with their global warming narrative, gas taxes are among the most regressive forms of tax as they disproportionately impact lower-income families. And unfortunately, unlike the cost of other goods and services that are driven to artificially high levels by misinformed government policies (did someone say Obamacare? ), we suspect you’ll never see the leftist states of America subsidizing gasoline for poor people. Despite serving as an easy scapegoat, as the U.S. Energy Information Administration notes, only 48% of the price that Americans pay at the pump actually goes to the evil oil companies for crude production. Meanwhile, on average, nearly 20% of gas costs get sent to various federal, state and local government entities with the highest taxed states like PA, WA, NY and CA collecting even more. A double-whammy of bullish news hit WTI crude futures shortly after 1300ET today sending prices soaring. First, The White House denied earlier rumors on changes to the ethanol mandate; and then Reuters confirmed OPEC production cut compliance steady at 94%. The White House is denying rumors on changes to the ethanol mandate. OPEC has cut its oil output for a second month in February, a Reuters survey found on Tuesday, allowing the exporter group to boost already strong compliance with agreed supply curbs on the back of a steep reduction by Saudi Arabia. And the resultant spike in crude prices (ahead of tonight’s API inventory data). After a volatile day of White House rumors and denials, and OPEC headlines, WTI and RBOB ended the day lower ahead of tonight’s API data which showed a slightly smaller than expected crude build (+2.5mm against expectations of +3mm). However RBOB prices tumbled after an unexpected build. If this holds for DOE data tomorrow it will be another new recod high for crude inventories. Notably, along with denied reports of a shift in ethanol mandates, and reports of 94% OPEC cut complicance, U.S. shipments of crude by rail averaged ~377k b/d in December vs ~432k b/d in November, lowest since May 2012, EIA’s Petroleum Supply Monthly report shows. The 30 yr bond yield 2.974, DOWN 1 IN BASIS POINTS from MONDAY night. USA dollar index early TUESDAY morning: 100.97 DOWN 20 CENT(S) from FRIDAY’s close. the Italian 10 yr bond yield is trading 44 points HIGHER than Spain. The British pound at 5 pm: Great Britain Pound/USA: 1.2380 : down 57 BASIS POINTS. But the Dollar isn’t buying it at all (and nor are bonds)… So WTF is going on in Fed Funds Futures? There hasn’t been much in the way of economic news in the past few days. Durable goods orders and GDP were weak; consumer confidence was strong. Fed speak was repetitious. But Fed funds futures hike probabilities have shot to 54% from 37% since Thursday. One idea is pure manipulation. A bank that wants to see a hike might be buying Fed funds futures to try and somehow manipulate the Fed’s thinking. Or it could be some other kind of leak from the Fed? Or maybe someone is just making a big bet it’s going to happen as they take a closer look at the data. What’s curious is that the US dollar hasn’t gone along for the ride. That suggests it’s not fundamental. And the absolute level of real yields have plunged back to earth as Trumpflation bets fade fast. Please… please… STFU with the “banks are surging due to steepening yield curves helping NIM” narrative… this is all about allowing the bank execs out and deregulation (and releveraging) hope. On the heels of a disappointing revised Q4 GDP print, the US trade balance for January printed a $69.2 billion deficit. This is the second largest deficit since August 2008 (slightly smaller than the March 2015 plunge) as the dollar surge has not helped. The $69.2bn deficit is considerably worse than the $66.0 billion expectations, and is lower than the lowest analyst expectation. Certainly not a good sign for Q1 GDP expectations. As BofAML notes, combining trade data with inventories for January, this slices 0.2pp from Q1 GDP tracking, leaving us at 1.8% for the quarter. So time for another rate hike to reverse that recent drop in the USD and stymie the US economy even more via its trade deficit? Following a series of better than expected GDP-feeding prints, consensus had expected Q4 GDP to tick higher in the first revision released today, rising from 1.9% to 2.1%. However, that did not happen and instead, the revised print came in unchanged at 1.9%. Notable underlying revisions include: an upward revision in consumer spending, both in services and goods; a downward revision to business investment, mostly in intellectual property products and equipment; and a downward revision to state and local government spending, primarily in structures. Despite the headline miss, the revised data showed a solid rebound in Personal Consumption Expenditures, which rose 3.0%, higher than the 2.6% expected; furthermore, printing at 2.05% annualized, Consumption alone was higher than the overall GDP of 1.86%. The reason for the miss was a decline in Fixed Investment which slid from 0.67% to 0.51% as initial CapEx reads appear to have been weaker than expected, coupled with a negative revision to both Private Inventories, down from 1.00% to 0.94% and the contribution from Government, which subtracted another 0.15% point. Net trade remained flat, and was the biggest detractor from Q4 growth, taking away some 1.7% as the Q3 surge of exports to China was offset. Of note: PCE prices failed to hit the expected 2.2% increase in the quarter, rising 1.9%, after increasing 1.5% in Q3, thus giving the Fed some more breathing room before hiking. Additionally, core PCE rose 1.2%, after rising 1.7% in the prior quarter, suggesting to Janet Yellen there is still some price slack, and the possibility of a rate hike may be more remote. For the year 2016, real GDP increased 1.6% , compared with 2.6% in 2015. The increase in real GDP in 2016 reflected increases in consumer spending, residential investment, state and local government spending, exports, and federal government spending. These contributions were partly offset by declines in private inventory investment and business investment. Imports increased. But the most troubling part of the release was the company’s disappointing guidance: Target now sees 1Q adj. EPS of 80c to $1.00, far below the consensus estimate $1.33, and also over 20% below the lowest firecast (range $1.26-$1.41). The bleeding is expected to continue on the back of a “Low-to-Mid Single Digit Decline” in comp store sales in both Q1 and the full year. Also, for the full year, Target sees adj. EPS of $3.80 to $4.20, wildly missing consensus of $5.34 (range $5.05-$5.60). In other words, expect more of the same from America’s biggest retailers who are now stuck in a fight for market share, even as prices continue to decline, forcing CFOs to come up with increasingly more innovative ways of preserving margins and profits. At last check, TGT was trading 12% lower after the earnings, wiping out $4 billion in market cap and weighing in on peers such as Walmart. Update: the March odds continue to surge and are now at 72% and rising. The Fed is really doing its best to convince the market that a March rate hike is coming, and it seems to be working. First, it was Philly Fed president Patrick Harker, who speaking at Temple University reiterated his comments from February 15, and said that not only is the economy in pretty good shape, but that he continues to see three rate increases as appropriate in 2017. And result, Eurodollar and Fed Fund futures traders reacted as if stung, and trading below 50% earlier today, the March rate hike odds have soared as high as 68% over the past hour – they were at 54% before Dudley started talking – effectively above the Fed’s permissive threshold. As a reminder, the Fed usually hikes only if the market prices in at least a 70% probability of such an event. Well, we are now almost there. One question for now remains – why is the dollar not following through? After crashing to its lowest print in a year (in January), MNI’s Chicago PMI soared in February to 57.4 – well above the highest expectation – to the highest since Jan 2015. The median estimate of 35 economists was 53.5 – this surge to 57.4 is above the highest of those expectations with 6 of the sub-components rising. The biggest spike was in Prices Paid – surging to 68.6 – as stagflation once again rears its ugly head. Another ‘soft’ survey data beat to go with the ‘hard’ data misses. 2016 was a rough year for the so-called brick-and-mortar retailers with several mall-based apparel companies, including Aéropostale, Pacific Sun and American Apparel, being forced to seek chapter 11 bankruptcy protection. Meanwhile, The Sports Authority didn’t even bother with a reorg plan as creditors decided that a liquidation was the best way to maximize value for creditors. But it’s not just the niche apparel retailers that are having a hard time competing for those scarce consumer dollars. Target plunged as much as 14% on the open this morning after announcing that steep price cuts would be required in 2017 to compete with the likes of Wal-Mart and the online retailing giant, Amazon (see “Target Plunges 12% After Missing Lowest EPS Estimate, Slashing Outlook“). Unfortunately, at least according to Moody’s retail credit analyst Charlie O’Shea, the environment for retailers in the U.S. is likely to get worse before getting better. As Moody’s notes, the number of distressed U.S. retailers has more than tripled since the Great Recession of 2008-2009, and with $5 billion worth of debt maturities over the next 4 years, the situation is likely to get much worse. Over the past six years the number of US retailers on the lowest and distressed tier of its rating spectrum has tripled, Moody’s Investors Service says in a new report. Not since the 2008-09 recession has the percentage been so high, and the rising tide coincides with an increasing number of such companies across all industries. This situation comes on the heels of a protracted period of low interest rates, when the availability of cheap money serves as a “dinner bell” for sponsors to feast on target companies, O’Shea says in “Distressed Retailers Are on the Rise; Who’s Next?” Each such cycle begets a new pool of B2 or B3 rated companies, which don’t have far to fall into the lowest rating tier. Among companies, Claire’s, J Crew, Tops and rue21 have all been hamstrung with weak credit metrics after taking on high levels of debt to fund acquisitions. And while the number of low-rated retailers is growing, so are debt maturities, Moody’s says. The 19 Caa/Ca companies in the agency’s retail portfolio owe roughly $5 billion in debt through 2021, with about 40% of this due by the end of 2018 and a spike during 2019. While the credit markets remain open to companies up and down the rating spectrum, that could change abruptly if investor sentiment turns. Among other considerations, interest rates have begun to trend upward, while US speculative-grade companies have a record $1 trillion of debt coming due in the next five years, which could make refinancing much more difficult for distressed names.